I write to inform you that Kier will be completing resurfacing works at the above location on behalf of Highways England. Previous surveys have identified the need for maintenance works in this location, for road safety reasons. We advise motorists to allow extra time to complete their journey whilst using the diversion route. We encourage drivers to stick to speed limits and follow appropriate signage. We would be grateful if you would share information locally about the works. 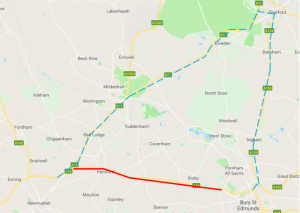 Traffic will be diverted from the A14 westbound at junction 43 via the A134 northbound towards Thetford, A11 southbound towards Newmarket, before re-joining the A14 at junction 38. The map below shows the westbound closure and strategic diversion route.